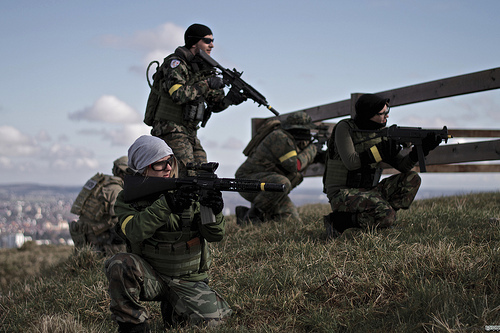 Properly named ‘Airsoft Skirmishing’, but obviously abbreviated, this is not a sport for the faint-hearted. However, if there’s nothing you love more than getting up on a Saturday morning to get shot at by lightweight, high-powered BB pellets that can hit you at a rate of 15 per second while travelling at 300 feet a second, well, you’ve come to right place. However, many people are relatively unsure how to get started in this high endurance game of wits, skills and fitness. There’s a tonne of info out there on how to improve your game, but how about just picking up the gun and finding somewhere to go? Well, today I hope to answer all your questions in this simple guide which will tell beginners everything that they need to know. Your gun is quite possibly the most important piece of kit that you’ll have. It’s effectively what’s going to stop you getting ‘killed’, as long as you take out the other person first. When searching for the gun to suit you, try taking a look at some like the M4A1 or the M16. These are great pieces of kit because they’re durable and perfect for beginners. They’ll even last as you improve your skill. Some other good brands to consider include Javelin, Magpul, Classic Army and KWA. To make your gun a hell of a lot more effective, and exciting, there’s a tonne of extras you can choose from. Of course, these are completely optional, but the chances are that your opponents will have them and they’ll help them get you. Try looking at red-dot or holographic dot sights, maybe even ACOG sights if you’re planning to go for the long-range shots. You might also want to look into grips, but this will solely depend on your personal preference. As you can imagine, getting shot by a pellet travelling 300 feet a second is going to hurt, probably even bruise, so you’re probably going to want some sort of armour. Fortunately, you’re in luck. The first thing you’re going to want to consider is where you’re playing. Are you playing in the woods? Maybe a make-shift factory or city area? This is important because you’ll want to determine which colour to get for camouflage. If the enemy can’t see you, they can’t hit you. As an extra tip, don’t get black. It doesn’t work in the day or the night. Patterns work best. There is a tonne of premade vest sets online; you’ve just got to find one you like. Before you go running headfirst into battle, make sure you’ve got all the gear. The best way to do this is by making sure you’ve made a shopping list of all the things you’ll need. This will need to include your gun, your armour, your bullets, your optional yet essential extras and anything else you’ll think you’ll need. This is to make sure you don’t find yourself in your first live combat situation only to realise you’ve forgotten to buy ammo. The whole premise of airsoft is playing honestly and fairly. The main rule you’ll have to follow is shouting ‘HIT’ when you’re hit, raising your arms above your head with your gun and walking to what is known as a respawn point, unless you stay put and you’re revived by a medic. This will solely depend on who you’re playing with and where. Don’t even try about thinking about lying. Many of the players and marshalls in your game will be highly experienced, and they’ll know if they hit you and you’ll simply be banned from playing. Now that you’ve got the basics, it’s time to start figuring out where to play. No matter what country or region you’re from, the chances are that there’s a place to play near you. List up all the potential sites you’d like to play at and then call them if you have any questions before you start, such as price, rules and inventory etc. Weather doesn’t normally affect games, in fact, it usually makes it more exciting so don’t be afraid of getting wet or cold. Also, don’t worry if you don’t think that you’re not fit enough to play. By playing a game or two, you’ll be improving your fitness, and you’ll soon be able to run about as though you’re in the matrix. The first game can always feel quite intimidating, and things get real very quickly but don’t worry, you’ll soon find your style. Don’t forget to enjoy yourself! Rachel Summers is a freelance writer whose passion is helping students get the most out of their learning journey. She started out as a writer and journalist in the newspaper industry, including UK Top Writers, before breaking out to go freelance and follow her own passions. Her writing is designed to help you get the most out of college. This entry was posted in Airsoft, Land Sports and tagged Airsoft, Beginners. Bookmark the permalink.